The Starlight flowering dogwood is a hybrid variety that is hardy to plant in USDA growing zones 6 and 7. The plant might grow in zones 6 through 9 if provided with proper heat protection. Starlight flowering dogwood reaches a height of 20 feet and produces white blooms that attract bees and butterflies in late spring. The Starlight flowering dogwood prefers a well-draining, acidic soil. The plant prefers partial shade but will tolerate full sun. Test the soil pH prior to planting as the dogwood grows best in a soil pH of 6.1 to 6.5. Mix ground rock sulfur into the soil to lower the pH number. Water the soil well after amending and let it rest for at least two weeks before planting. Dig a hole that is the same depth and twice as wide as the plant's container. Mix equal portions of organic compost into the removed soil as the plant prefers a nutrient rich soil. Set the plant into the hole making sure the top of the root ball is at ground level. Fill half the hole with amended soil and water well to compact the soil and hydrate the root ball soil. Verify the dogwood is standing straight and fill the remaining hole with soil. Gently tamp the soil to eliminate air pockets and apply water to saturate the soil to several inches. Space the plants 15 to 20 feet apart. 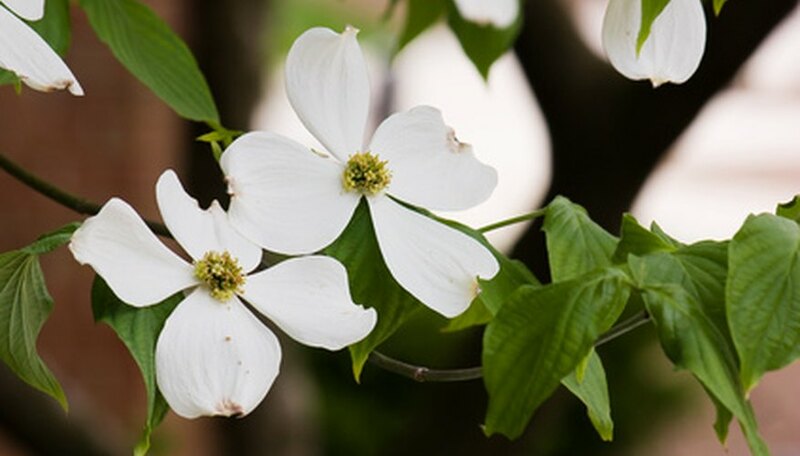 Water the Starlight flowering dogwood regularly to keep the soil moist during the growing season. Additional applications of water may be required during the hot summer months and periods of drought. Do not over water or create standing water around the stem as this promotes root rot. Fertilize the plant with a complete, all-purpose type fertilizer each spring. Do not use a fertilizer that is high in nitrogen as this will increase foliage growth and decrease flower production. Apply 2 to 3 inches of mulch around the plants to increase moisture retention and decrease weed growth. Add a new layer of mulch each year if it has decomposed. Take softwood cuttings in late spring. A softwood cutting is taken from new growth that is green and flexible. Dip the cut end into rooting hormone and stick the cutting into a rooting tray filled with sterile medium. Water the tray and place it in a warm location with indirect sunlight. Transplant the cuttings to individual growing containers once they reach a length of one inch or more. Monitor the Starlight flowering dogwood for the presence of wood borer insects. The borers will furrow under the bark and create deep grooves and holes in the woody stems. The leaves will grow small and the dogwood will begin to die at the stem crown. Treat an infestation with a chemical insecticide. Prevent insect problems by providing adequate water and fertilizer as healthy plants are less susceptible an infestation.